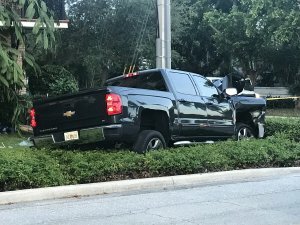 Two-Cars Crash in Fort Pierce In St. Lucie County | Schuler, Halvorson, Weisser, Zoeller & Overbeck P.A. The St. Lucie County family escaped their kidnapper only to get picked up by a truck and suffer injuries in a crash. Police say it began when a woman, her 6-week-old infant, and her father who were kidnapped from their St. Lucie County home and forced into a vehicle, said the FHP. The father, who was placed in the trunk, escaped from the vehicle. He was able to rescue the woman and infant, police say. Uninjured, all three were picked up by a man in a truck. A BMW crashed into the back of the truck and wound up in a ditch. Police found a man, two women and two female youths inside the crashed white BMW. All five were injured and transported to a nearby hospital. The victims in the truck suffered minor injuries and were treated at the scene. Police haven’t disclosed the cause of the crash but believe drugs and alcohol may have been involved. The kidnap victims are recovering. Police are still investigating the incident and searching for the person responsible.